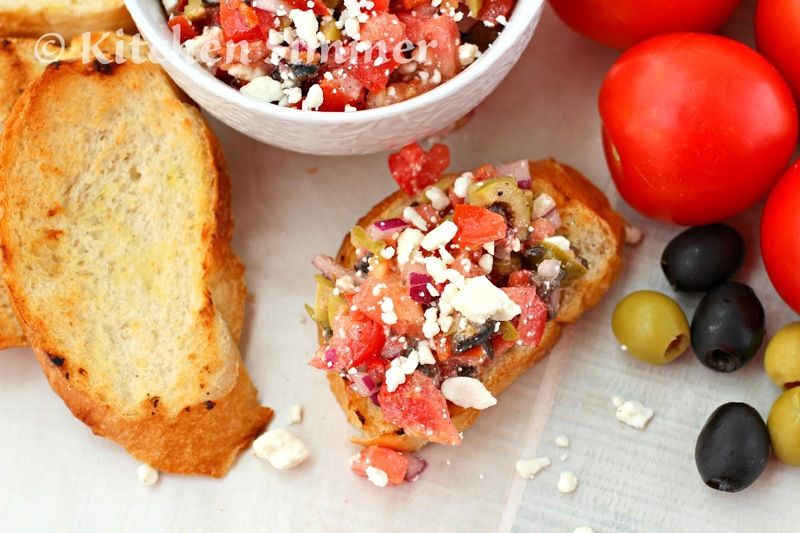 This Greek Tomato and Feta Bruschetta Appetizer is fun, fresh and full of bold flavors. It is a great way to add some fresh veggies to your holiday table that's not your typical veggie platter with dip. I decided to share an appetizer today because we are less than two weeks from Christmas and the holiday parties are in full swing. 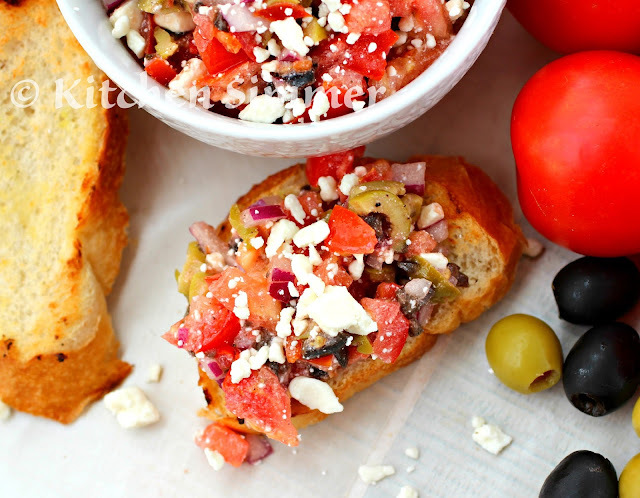 This bruschetta is a great addition to any party. 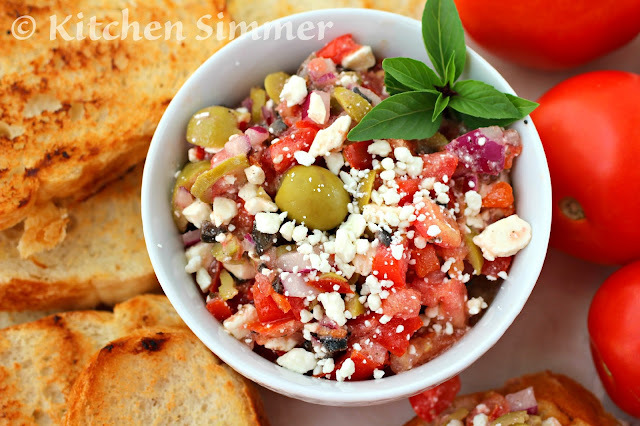 I don't usually make bruschetta this time of year since it's cold outside and I would serve only warm dips and appetizers. The funny thing is Mother Nature decided to give us some spring like weather in the 70's...that's about 20-30 degrees warmer than usual! That made me think a cool and refreshing appetizer would be certainly welcome. 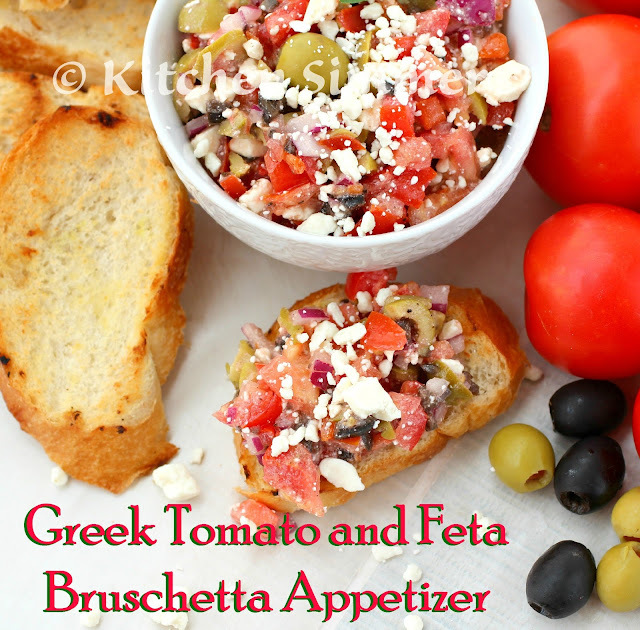 So as we break some weather records in my area, think "fresh" this holiday season with my Greek Tomato and Feta Bruschetta Appetizer. Prepare all ingredients and toss together. Serve right away for best results. If you are making this a few hours ahead, add feta cheese just before serving. Grill, toast or bake bread as desired. I grilled it on the stove top. These are so perfect for holiday parties! 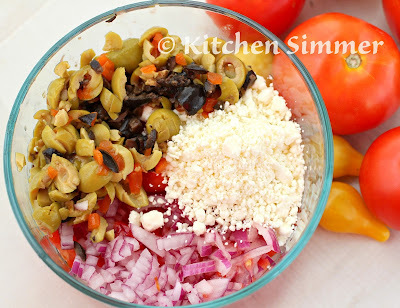 This has all the flavors to be my kind of perfect appetizer! Brushetta is always a good appetizer. I just need a glass of wine to make it perfect. Thanks for sharing. A tasty and easy little snack and great for this time of year. Looks very easy to throw together! Thanks for the idea!